Ethno-religious conflict in multi-cultural societies has been one of the major causes of loss of life and property in recent history. In this paper, we present and analyze a multi-agent game theoretic model for computational study of ethno-religious conflicts in multi-cultural societies. Empirical fact-based research in sociology and conflict resolution literature have identified (a) ethno-religious identity of the population, (b) spatial structure (distribution) of the population, (c) existing history of animosity, and (d) influence of leaders as some of the salient factors causing ethno-religious violence. It has also been experimentally shown by Lumsden that multi-cultural conflict can be viewed as a Prisoner’s Dilemma (PD) game. Using the above observations, we model the multi-cultural conflict problem as a variant of the repeated PD game in graphs. The graph consists of labeled nodes corresponding to the different ethno-religious types and the topology of the graph encodes the spatial distribution and interaction of the population. 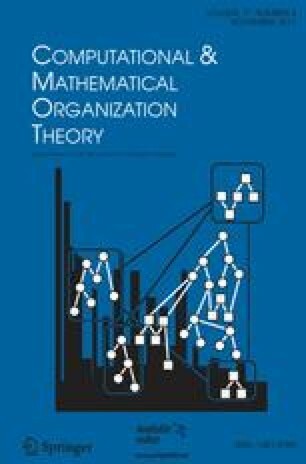 We assume the structure of the graph to have the statistical properties of a social network with the high degree nodes representing the leaders of the society. The agents play the game with neighbors of their opponent type and they update their strategies based on neighbors of their same type. This strategy update dynamics, where the update neighborhood is different from the game playing neighborhood, distinguishes our model from conventional models of PD games in graphs. We present simulation results showing the effect of various parameters of our model to the propensity of conflict in a population consisting of two ethno-religious groups. We also compare our simulation results to real data of occurrence of ethno-religious violence in Yugoslavia.